Searching for a Cloud Security Provider can be confusing. Many providers appear the same at first glance: similar metrics, similar promises. The fact is, the information you need to make a real comparison requires asking questions and probing for details that cloud services vendors don’t always volunteer. 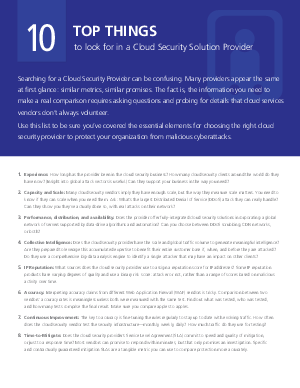 Use this list to be sure you’ve covered the essential elements for choosing the right cloud security provider to protect your organization from malicious cyberattacks.